EBITDA increases 12.4% to € 189.0m. Net profit declines to € 31.6m due to previously announced special effects. VIA´s management gives a positive outlook for 2012. Revenue recorded by the Flughafen Wien Group rose by 9.0% to € 582.0m in 2011, and EBITDA increased 12.4% to € 189.0m. As expected, previously announced impairment charges and non-recurring effects reduced net profit to € 31.6m (-58.3%), while EBIT amounted to € 67.2m (-34.3%). The EBITDA margin improved from 31.5% in the previous year to 32.5%. “The operating business showed sound development in 2011 and the measures implemented to reduce costs and improve productivity are taking effect. This fresh wind is good for the company“, summarised Günther Ofner, member of the Management Board (CFO) of Flughafen Wien AG. A total of € 262.8m was invested in 2011, € 160m will be spent this year and plans call for investments of € 590m by 2015. “The start of operations in the Skylink will move us a great step forward and we must then concentrate on renovating the older facilities. Vienna Airport still has significant potential in the areas of real estate, shopping, gastronomy and hotels. In order to realise these investments without increasing debt, we must continue to reduce costs and improve productivity“, explained Ofner. “2011 was a record year for passenger traffic, a development that is also reflected in revenue. Now we are setting the course for further growth at the airport location: Our recently signed growth agreement with Austrian Airlines will provide support, above all, for long-haul destinations and transfers, and create a very attractive situation for all airlines“, commented Julian Jäger, member of the Management Board (COO) of Flughafen Wien AG. Vienna Airport remains the least expensive hub in the Star Alliance, ranking ahead of Munich, Zurich and Frankfurt. Based on the development of business, the annual general meeting on 24 April 2012 will be asked to approve a dividend of € 1.0 per share for the 2011 financial year. This would represent a total distribution of € 21.0m as well as a pay-out ratio of 66.5% and a dividend yield of 3.4% based on the share price as of 31 December 2011. In spite of the economic uncertainty, the Management Board of Flughafen Wien is cautiously optimistic concerning the development of busines in 2012. The target calls for EBITDA of at least € 200m and net profit of over € 50m as well as net debt that does not exceed four-times EBITDA, i.e. less than € 800m. A slight increase is also expected in revenue. External revenue in the Airport Segment rose by 13.3% to € 294.6m in 2011. The Handling Segment recorded a 2.9% decline in revenue to € 160.5m. The Retail & Properties Segment generated an increase of 18.2% in revenue to € 110.6m, and external revenue in the Other Segments rose by 11.3% to € 16.1m. 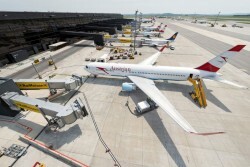 Vienna Airport set a new record in 2011 with a total of 21,106,292 passengers handled (+7.2%). The number of passengers travelling to the Middle East rose by 3.5%, while traffic to Eastern Europe increased 14.9% and impressively underscored Vienna’s role as a hub to the CEE region. Maximum take-off weight was 3.7% higher; flight movements matched the prior year level at 246,157; and cargo (incl. trucking) declined 6.2% due to the weaker economic environment. Passenger traffic at VIA´s international investments developed as followed in 2011: Malta Airport generated a profit of € 11.9m (+11.4%) based on 3,506,521 passengers. Friedrichshafen Airport handled 571,709 passengers and recorded a loss of € 2.7m for the year. As previously announced, this investment was written off in full during 2011. Košice Airport handled 266,143 passengers and recorded a loss of € 19.3m. An impairment charge was recognised to this investment during the reporting year, as also previously announced. In 2011 Košice Airport reported positive operating earnings.